It's called June gloom. 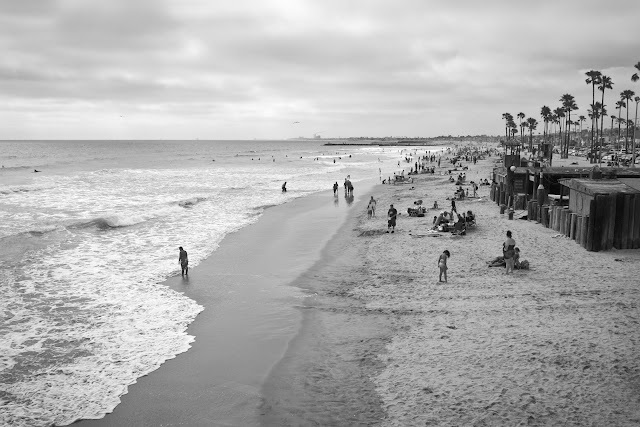 It was warm and sunny, here, a few miles inland, but as I drove closer to the shore, the skies were cloudy and when walking about, it eventually became jacket weather — despite what may be indicated by the attire of the swim-suited crowd down on the beach. The surfers are smart enough to wear their wet-suits out in those chilly Pacific waters, but those non-surfing beach goers must be waiting for a sun that never bothered to show itself for the day. I did see a few folks go running knee deep into the water only to quickly turn around and scurry back to the sand for the comfort of their towels.